As I tell my students, most of whom come to a graduate program looking to gain analytical skills, nothing is more important to public policy than being able to understand justice and fairness from multiple perspectives. Just about all political discussions come down to what is good, right, or “fair,” and virtually all participants carry within them various conceptions of goodness, rightness, and fairness based on their own values and experiences. This is big-picture thinking with practical applications, and my work here is designed to help us understand what justice means in cities and in planning for cities. Schweitzer, L. and M. Stephenson. 2015. “Planning, Development, and Media: A Case Study of the Woodrow Wilson Bridge.” Journal of Planning Education and Research. Lajonchere, C., B. Wheeler, T. Valente, C. Kreutzer, A. Munson, S. Narayanan, A. Kazemzadeh, A, R.Cruz, I Martinez, S. Schrader, L. Schweitzer, T. Chklovski, D. Hwang. 2015. “Strategies for Disseminating Information on Biomedical Research on Autism to Hispanic Parents.” Journal of Autism and Development Disorders. DOI: 10.1007/s10803-015-2649-5. Schweitzer, L. 2014. 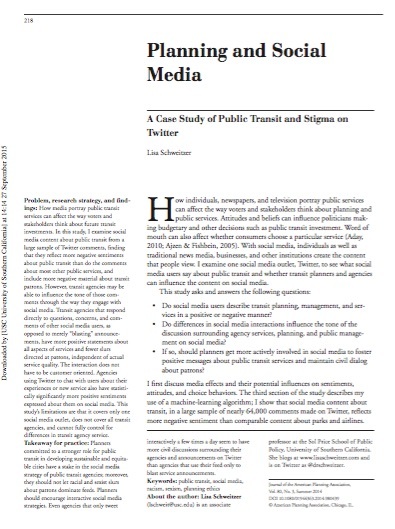 “Planning and social media: A case study of public transit.” Journal of the American Planning Association. 80 (3): 218-238. —Recipient of the Best Paper Award for the Journal of American Planning Association (volume 80). Knox, P. and L. Schweitzer. 2010. “Design Determinism, Post-Meltdown: Urban Planners and the Search for Policy Relevance.” Housing Policy Debate. 20(2): 317-327. Schweitzer, L. and S. Kim* 2009. “Environmental Justice and Collaborative Governance: Building A Socio-Spatial Perspective for Facility Siting.” International Review of Public Administration. 13: 45-59. Schweitzer, L. and M. Stephenson. 2008. “Charting the Paradoxes of Constructivism in Professional Education.” Teaching in Higher Education. 13 (5): 583-593. Available online: doi: 10.1080/13562510802334947. Schweitzer, L. and M. Stephenson. 2007. Right Answers, Wrong Questions: Environmental Justice as Urban Research. Urban Studies. 44(2): 319-337. Available online: doi:10.1080/00420980601074961. 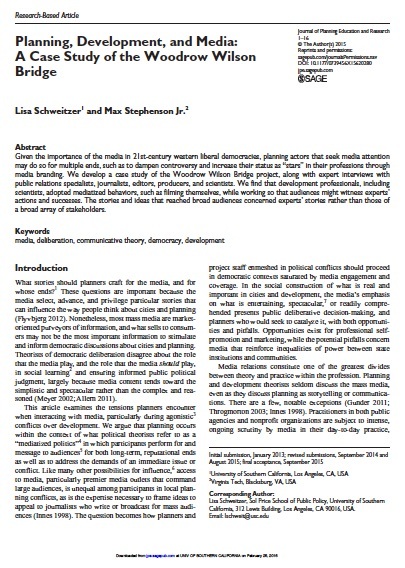 Given the importance of the media in 21st-century western liberal democracies, planning actors that seek media attention may do so for multiple ends, such as to dampen controversy and increase their status as “stars” in their professions through media branding. We develop a case study of the Woodrow Wilson Bridge project, along with expert interviews with public relations specialists, journalists, editors, producers, and scientists. We find that development professionals, including scientists, adopted mediatized behaviors, such as filming themselves, while working so that audiences might witness experts’ actions and successes. The stories and ideas that reached broad audiences concerned experts’ stories rather than those of a broad array of stakeholders. How should planners in public institutions restore relationships after they have done things that cause harm to communities? This manuscript examines how Sandercock’s therapeutic imagination in planning relates to the public ethics outlined by legal and political theorists. I explore the moral paradox for planning theory of the desire to engage in healing with communities when public institutions remain accountable to democratic majorities. That paradox defines three duties for planners in possession of Sandercock’s “therapeutic” imagination who would support healing and change via the profession of planning. How media portray public transit services can affect the way voters and stakeholders think about future transit investments. In this study, I examine social media content about public transit from a large sample of Twitter comments, finding that they reflect more negative sentiments about public transit than do the comments about most other public services, and include more negative material about transit patrons. However, transit agencies may be able to influence the tone of those comments through the way they engage with social media. Transit agencies that respond directly to questions, concerns, and comments of other social media users, as opposed to merely “blasting” announcements, have more positive statements about all aspects of services and fewer slurs directed at patrons, independent of actual service quality. The interaction does not have to be customer oriented. Agencies using Twitter to chat with users about their experiences or new service also have statistically significantly more positive sentiments expressed about them on social media. This study’s limitations are that it covers only one social media outlet, does not cover all transit agencies, and cannot fully control for differences in transit agency service. Planners committed to a stronger role for public transit in developing sustainable and equitable cities have a stake in the social media strategy of public transit agencies; moreover, they should not let racial and sexist slurs about patrons dominate feeds. Planners should encourage interactive social media strategies. Even agencies that only tweet interactively a few times a day seem to have more civil discussions surrounding their agencies and announcements on Twitter than agencies that use their feed only to blast service announcements. Schweitzer, L. and M. Stephenson. 2008. Charting the Paradoxes of Constructivism in Professional Education. Teaching in Higher Education. 13 (5): 583-593. Available online: doi: 10.1080/13562510802334947. Learning networks, such as a community of practice, can be an important way for planners to gain access to, and power in, new professional knowledge domains. 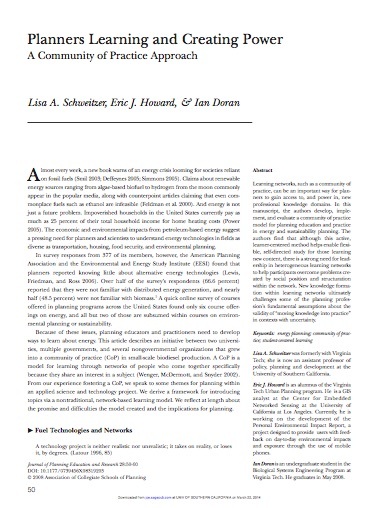 In this manuscript, the authors develop, implement, and evaluate a community of practice model for planning education and practice in energy and sustainability planning. The authors find that although this active, learner-centered method helps enable flexible, self-directed study for those learning new content, there is a strong need for leadership in heterogeneous learning networks to help participants overcome problems created by social position and structuration within the network. New knowledge formation within learning networks ultimately challenges some of the planning profession’s fundamental assumptions about the validity of “moving knowledge into practice” in contexts with uncertainty. Environmental justice, a term that incorporates ‘environmental racism’ and ‘environmental classism,’ captures the idea that different racial and socioeconomic groups experience differential access to environmental quality. 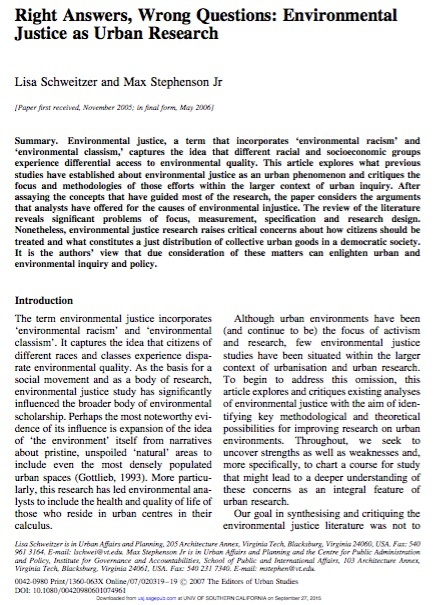 This article explores what previous studies have established about environmental justice as an urban phenomenon and critiques the focus and methodologies of those efforts within the larger context of urban inquiry. After assaying the concepts that have guided most of the research, the paper considers the arguments that analysts have offered for the causes of environmental injustice. The review of the literature reveals significant problems of focus, measurement, specification and research design. Nonetheless, environmental justice research raises critical concerns about how citizens should be treated and what constitutes a just distribution of collective urban goods in a democratic society. It is the authors’ view that due consideration of these matters can enlighten urban and environmental inquiry and policy. For more than a decade US transport policy has shifted or ‘devolved’ responsibility for transportation decision making away from the federal government toward lower jurisdictions. Decentralization is intended to foster social experimentation and, ultimately, improve transit planning and service provision. 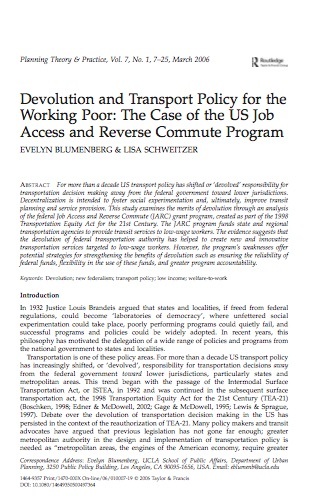 This study examines the merits of devolution through an analysis of the federal Job Access and Reverse Commute (JARC) grant program, created as part of the 1998 Transportation Equity Act for the 21st Century. The JARC program funds state and regional transportation agencies to provide transit services to low-wage workers. The evidence suggests that the devolution of federal transportation authority has helped to create new and innovative transportation services targeted to low-wage workers. However, the program’s weaknesses offer potential strategies for strengthening the benefits of devolution such as ensuring the reliability of federal funds, flexibility in the use of these funds, and greater program accountability. This paper explores collaborative transport planning among governmental authorities where jurisdictions overlap and the lines of authority are ambiguous or unclear–an increasingly common situation in this era of waning trade and travel restrictions. We do this by examining the experience of mandated collaborative transportation planning among state departments of transportation (DOTs) and metropolitan planning organizations (MPOs) in the USA following a significant change to national surface transportation policy in the early 1990s. To understand how state transport planning and plans changed following the inter-jurisdictional collaboration mandated by passage of the Intermodal Surface Transportation Efficiency Act of 1991 (ISTEA), we examine recent statewide transport planning in 14 of the largest US states and conducted interviews with 66 state and regional planners. We find that, despite the myriad topics that state DOTs tried to include within their comprehensive statewide plans, these plans have had, at best, a limited influence on metropolitan transport planning and activities. Despite this, we find that the mandated collaborative planning did help to increase inter-agency coordination on issues (1) where network or environmental externalities transcend regional boundaries, (2) that require the political clout of a higher-level governmental authority to enforce locally unpopular decisions, or (3) that take advantage of institutional economies of scale. Being able to access social and economic activities is key to human flourishing. My research here examines mobility and access as fundamental to economic justice and mobility. Liu, S., Murray-Tuite, P. M. and L. Schweitzer. 2014, “Uniting multi-adult households during emergency evacuation planning.” Disasters, 38: 587–609. Liu, S.*, P. Murray-Tuite, and L. Schweitzer. 2014. 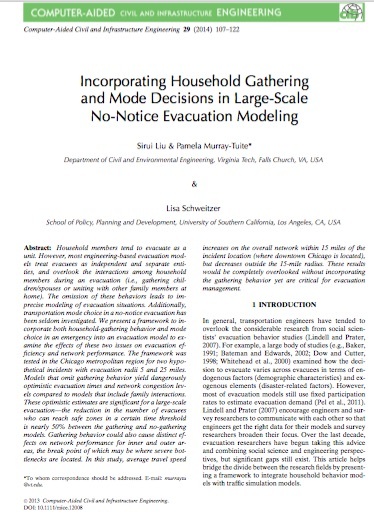 “Incorporating Household Gathering and Mode Decisions in Large-Scale No-Notice Evacuation Modeling.” Computer-Aided Civil and Infrastructure Engineering. (special issue). 29: 107-122. Zhou, J. * and L. Schweitzer. 2013. “Getting Drivers to Switch: Transit Price and Service Quality among Commuters.” Journal of Urban Planning and Development 137(4):477–483. Murray-Tuite, P., L. Schweitzer, and R. Morrison. * 2012. “Household No-Notice Evacuation Logistics: How well do households optimize?” Journal of Transportation Safety and Security,4(4), pp. 336-361. Liu, S.*, P. Murray-Tuite, and L. Schweitzer. 2012. “Analysis of child pick-up during daily routines and for daytime no-notice evacuations.” Transportation Research – Part A, 46, pp. 48-67. Zhou, J. *, Y. Wang*, and L. Schweitzer. 2011. 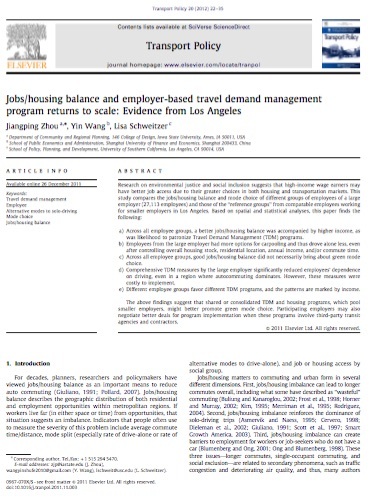 “Jobs/housing balance and employer-based travel demand management program returns to scale: Evidence from Los Angeles.” Transport Policy. 20: 22-35. Zhou, J.P.* and L. Schweitzer. 2009. “Transportation Planning Education in the United States.” Transportation Research Record. Schweitzer, L. and B. Taylor. 2008. 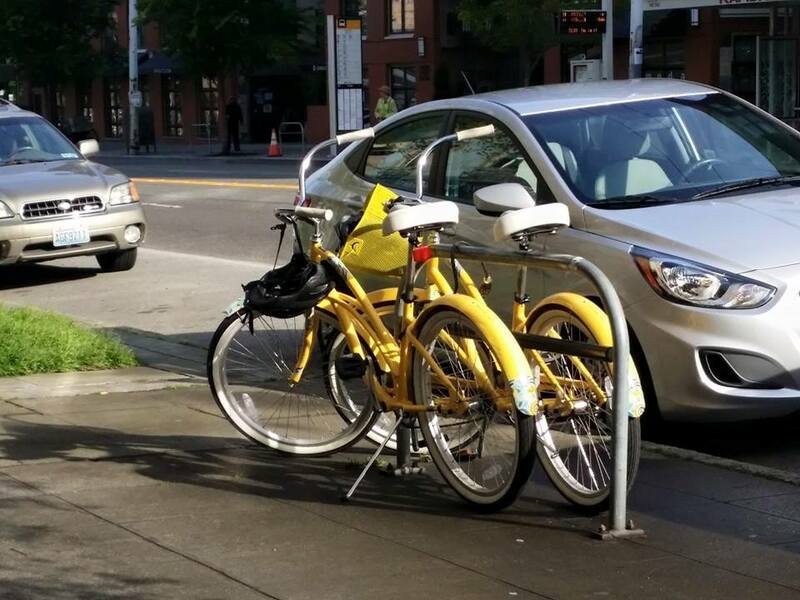 “Just Pricing: Equity and the Future of Road Finance.” Transportation. (65)6: 797-812. DOI: 10.1007/s11116-008-9165-9. 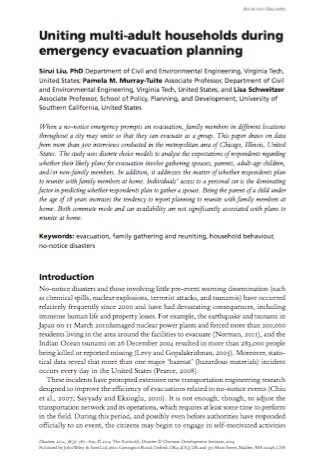 Liu, S., Murray-Tuite, P. M. and L. Schweitzer (2014), “Uniting multi-adult households during emergency evacuation planning.” Disasters, 38: 587–609. When a no-notice emergency prompts an evacuation, family members in different locations throughout a city may unite so that they can evacuate as a group. This paper draws on data from more than 300 interviews conducted in the metropolitan area of Chicago, Illinois, United States. The study uses discrete choice models to analyse the expectations of respondents regarding whether their likely plans for evacuation involve gathering spouses, parents, adult-age children, and/or non-family members. In addition, it addresses the matter of whether respondents plan to reunite with family members at home. Individuals’ access to a personal car is the dominating factor in predicting whether respondents plan to gather a spouse. Being the parent of a child under the age of 18 years increases the tendency to report planning to reunite with family members at home. Both commute mode and car availability are not significantly associated with plans to reunite at home. Household members tend to evacuate as a unit. However, most engineering-based evacuation models treat evacuees as independent and separate entities, and overlook the interactions among household members during an evacuation (i.e., gathering children/spouses or uniting with other family members at home). The omission of these behaviors leads to imprecise modeling of evacuation situations. Additionally, transportation mode choice in a no-notice evacuation has been seldom investigated. We present a framework to incorporate both household-gathering behavior and mode choice in an emergency into an evacuation model to examine the effects of these two issues on evacuation efficiency and network performance. The framework was tested in the Chicago metropolitan region for two hypothetical incidents with evacuation radii 5 and 25 miles. Models that omit gathering behavior yield dangerously optimistic evacuation times and network congestion levels compared to models that include family interactions. These optimistic estimates are significant for a large-scale evacuation—the reduction in the number of evacuees who can reach safe zones in a certain time threshold is nearly 50% between the gathering and no-gathering models. Gathering behavior could also cause distinct effects on network performance for inner and outer areas, the break point of which may be where severe bottlenecks are located. In this study, average travel speed increases on the overall network within 15 miles of the incident location (where downtown Chicago is located), but decreases outside the 15-mile radius. These results would be completely overlooked without incorporating the gathering behavior yet are critical for evacuation management. This manuscript examines employees’ participation in a free and discounted try-transit program called “Dump the Pump” (DtP) in Los Angeles, California. DtP offered eligible employee drivers a 12-week free transit pass and a discounted transit pass after the free trial as long as the employee drivers continued buying transit passes. By one-year after the program’s introduction, DtP attracted 33% more transit riders to the system. At the program’s zenith, 5% of the eligible drivers who lived within a half-mile from a direct transit line to their workplace had switched. Drivers were more likely to try the program under conditions in which (1) gas prices were relatively high and (2) the travel time difference between driving and transit was relatively low. After trying transit, participants remained on transit longer if they had no children, were unresponsive to lower gas prices, and had a bus schedule that matched their travel needs. The DtP experience indicates recruitment programs can attract drivers over the long-term, but those drivers who do stay with the program have more flexible commute schedules than drivers as a whole. These findings echo those of previous studies. Parents and other caregivers respond to service quality differences between transit and driving more than other commuters. Employers will need to consider that sensitivity when designing try-transit programs if they want drivers to stick with public transit. In no-notice events, adults must decide whether and how to gather household dependents. This article examines how effectively households plan their evacuation logistics for a daytime event in a multimodal network and how these plans match the outcomes of a nonlinear integer optimization approach that simultaneously determines optimal meeting locations, final destinations, and family member pickup assignment and sequencing. The model outcomes are compared to information from 59 in-depth interviews. Households largely assign emergency-gathering activities to the parent normally responsible for child-related travel and prefer to meet at home; these decisions are optimal only in some cases. The authors also identify the sensitivity of the optimized logistics to the time adults spend at pickup locations gathering their dependents and “break-even” points where a combination of walking and trains become competitive with personal vehicles. For some households, the additional travel time to make these modes competitive is fewer than 2 h, which is not necessarily an unexpected delay during evacuations. Thus, emergency management agencies should continue to include transit agencies in their planning process and ensure that employees are available to provide services for cases where severe congestion is encountered, and not just for socioeconomically vulnerable populations. In a no-notice disaster (e.g., nuclear explosion, terrorist attack, or hazardous materials release), an evacuation may start immediately after the disaster strikes. When a no-notice evacuation occurs during the daytime, household members are scattered throughout the regional network, and some family members (e.g., children) may need to be picked up. This household pick-up and gathering behavior was seldom investigated in previous work due to insufficient data; this gap in our understanding about who within families handles child-gathering is addressed here. Three hundred fifteen interviews were conducted in the Chicago metropolitan area to ascertain how respondents planned their response to hypothetical no-notice emergency evacuation orders. This paper presents the influencing factors that affect household pick-up and gathering behavior/expectations and the logistic regression models developed to predict the probability that parents pick up a child in three situations: a normal weekday and two hypothetical emergency scenarios. The results showed that both mothers and fathers were more likely to pick up a child under emergency conditions than they were on a normal weekday. For a normal weekday, increasing the distance between parents and children decreased the probability of parents picking up children; in other words, the farther parents are from their children, the less likely they will pick them up. In an emergency, effects of distance on pick-up behavior were significant for women, but not significant for men; that is, increasing the distance between parents and children decreased the probability that mothers pick up a child, but had a less significant effect on the fathers’ probability. Another significant factor affecting child pick-up behavior/expectations was household income when controlling for distance. 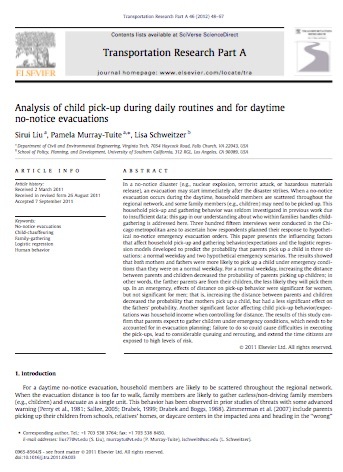 The results of this study confirm that parents expect to gather children under emergency conditions, which needs to be accounted for in evacuation planning; failure to do so could cause difficulties in executing the pick-ups, lead to considerable queuing and rerouting, and extend the time citizens are exposed to high levels of risk. 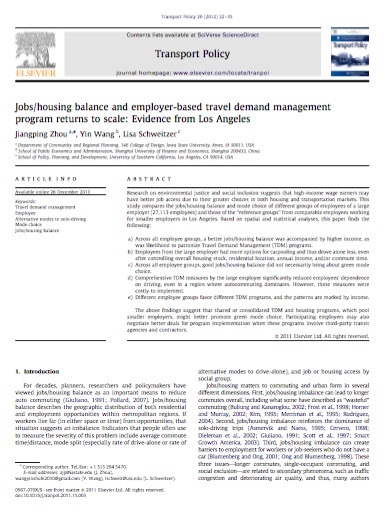 Across all employee groups, a better jobs/housing balance was accompanied by higher income, as was likelihood to patronize Travel Demand Management (TDM) programs. Employees from the large employer had more options for carpooling and thus drove alone less, even after controlling overall housing stock, residential location, annual income, and/or commute time. Across all employee groups, good jobs/housing balance did not necessarily bring about green mode choice. Comprehensive TDM measures by the large employer significantly reduced employees’ dependence on driving, even in a region where autocommuting dominates. However, these measures were costly to implement. Different employee groups favor different TDM programs, and the patterns are marked by income. The above findings suggest that shared or consolidated TDM and housing programs, which pool smaller employers, might better promote green mode choice. Participating employers may also negotiate better deals for program implementation when these programs involve third-party transit agencies and contractors. Liu, S.*, P. Murray-Tuite, and L. Schweitzer. 2011. “Relocating Children in Daytime No-Notice Evacuations: Methodology and Applications for Transport Systems of Personal Vehicles and Buses.” Transportation Research Record, 2234: 79-88. Schweitzer, L. and B. Taylor. 2008. Just Pricing: Equity and the Future of Road Finance. Transportation. (65)6: 797-812. DOI: 10.1007/s11116-008-9165-9. Those who oppose tolls and other forms of road pricing argue that low-income, urban residents will suffer if they must pay to use congested freeways. This contention, however, fails to consider (1) how much low-income residents already pay for transportation in taxes and fees, or (2) how much residents would pay for highway infrastructure under an alternative revenue-generating scheme, such as a sales tax. 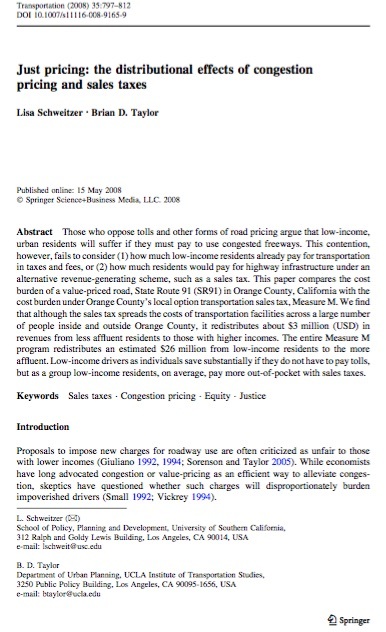 This paper compares the cost burden of a value-priced road, State Route 91 (SR91) in Orange County, California with the cost burden under Orange County’s local option transportation sales tax, Measure M. We find that although the sales tax spreads the costs of transportation facilities across a large number of people inside and outside Orange County, it redistributes about $3 million (USD) in revenues from less affluent residents to those with higher incomes. The entire Measure M program redistributes an estimated $26 million from low-income residents to the more affluent. Low-income drivers as individuals save substantially if they do not have to pay tolls, but as a group low-income residents, on average, pay more out-of-pocket with sales taxes. Camionetas are mini-vans privately operated as jitney services, run by immigrants for immigrants throughout cities in the US, Mexico, and Central America. Media accounts have portrayed camionetas as part of an unscrupulous industry that endangers and exploits riders, primarily farm workers and other undocumented laborers. Using interviews and ethnography, we analyze who patronizes camionetas in Southern California, and why. Patrons discussed why they use this service, their attitudes about it, other transportation options, and access to employment. Finally, we conducted empirical tests to determine whether these services are as exploitative of their riders as portrayed. 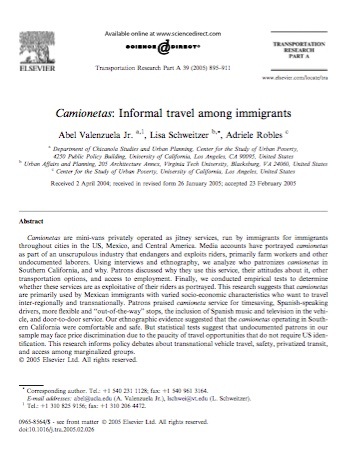 This research suggests that camionetas are primarily used by Mexican immigrants with varied socio-economic characteristics who want to travel inter-regionally and transnationally. Patrons praised camioneta service for timesaving, Spanish-speaking drivers, more flexible and “out-of-the-way” stops, the inclusion of Spanish music and television in the vehicle, and door-to-door service. Our ethnographic evidence suggested that the camionetas operating in Southern California were comfortable and safe. But statistical tests suggest that undocumented patrons in our sample may face price discrimination due to the paucity of travel opportunities that do not require US identification. This research informs policy debates about transnational vehicle travel, safety, privatized transit, and access among marginalized groups. While transportation provides mobility, cars, airplanes, and trucks create pretty serious environmental effects and threats human health. Those effects are not distributed equally–like most things–and my research here measures these issues. Schweitzer, L. and J. Zhou. * 2010. “Neighborhood Air Quality, Respiratory Health, and Vulnerable Populations in Compact and Sprawled Regions.” Journal of the American Planning Association. 76(3): 363-371. Schweitzer, L., Brodrick, C-J, , and S. Spivey. 2008.”Truck Driver Environmental Attitudes and Behaviors: An Exploratory Analysis.” Transportation Research Part D. 13 (3): 141-150. Schweitzer, L., Marr, J. Linford*, and M.A. Darby*. 2008. The Sustainable Mobility Learning Lab: Interactive Education on Sustainable Transport. Applied Environmental Education and Communication. 7 (1): 20-29. Available online: doi: 10.1080/15330150802194888. Crane, R. and L. Schweitzer. 2003. Sustainability, Transport, and the Built Environment. Built Environment. (29) 3: 238-252. Forkenbrock, D. and L. Schweitzer. 1999. 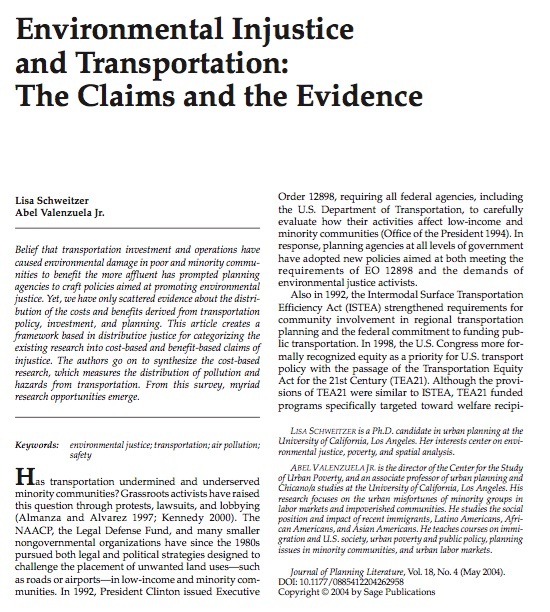 Environmental Justice and Transportation Planning. Journal of the American Planning Association. (65)1: 96-11. Large cities in the United States face multiple challenges in meeting federal air quality standards. One difficulty arises from the uncertainties in evaluating traffic-related air pollution, especially the formation of secondary pollutants such as ozone and some particulate matter. Current air quality models are not well-suited to evaluate the impact of a short-term traffic change on air quality. Using regional traffic and ambient air quality data from Southern California, we examine the impact of a two-day freeway closure on traffic and several criteria air pollutants (CO, NO2, O3, PM10, PM2.5). The results indicate that regional traffic decreased about 14% on average during the closure. Daily average PM2.5 levels decreased by about 32%, and daily 8-hour maximum ozone levels by about 16%. However, the daily 1-hour maximum NO2 concentration was higher at some sites during the closure. 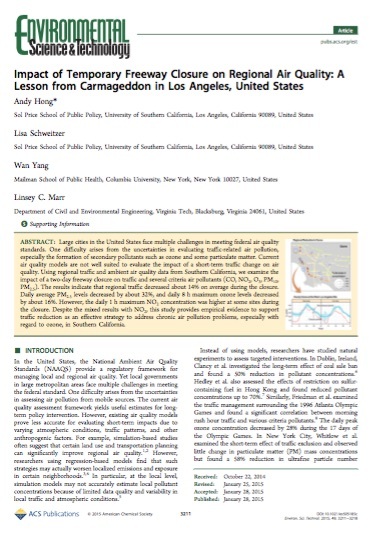 Despite the mixed results with NO2, this study provides empirical evidence to support traffic reduction as an effective strategy to address chronic air pollution problems, especially with regard to ozone, in Southern California. 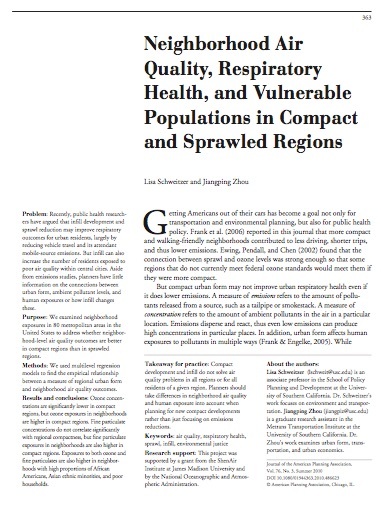 Recently, public health researchers have argued that infill development and sprawl reduction may improve respiratory outcomes for urban residents, largely by reducing vehicle travel and its attendant mobile-source emissions. But infill can also increase the number of residents exposed to poor air quality within central cities. Aside from emissions studies, planners have little information on the connections between urban form, ambient pollutant levels, and human exposures or how infill changes these.We examined neighborhood exposures in 80 metropolitan areas in the United States to address whether neighborhood-level air quality outcomes are better in compact regions than in sprawled regions.We used multilevel regression models to find the empirical relationship between a measure of regional urban form and neighborhood air quality outcomes.Ozone concentrations are significantly lower in compact regions, but ozone exposures in neighborhoods are higher in compact regions. Fine particulate concentrations do not correlate significantly with regional compactness, but fine particulate exposures in neighborhoods are also higher in compact regions. Exposures to both ozone and fine particulates are also higher in neighborhoods with high proportions of African Americans, Asian ethnic minorities, and poor households.Compact development and infill do not solve air quality problems in all regions or for all residents of a given region. Planners should take differences in neighborhood air quality and human exposure into account when planning for new compact developments rather than just focusing on emissions reductions. Environmental justice advocates in the US and internationally have argued that hazardous materials industries are a source of significant community disruption and environmental hazard. Few of these studies, however, have examined firms’ accident frequencies or how accidents are distributed across metropolitan regions. This research argues that accident frequencies differ significantly among firms, and they are an important part of understanding industries and their distribution within metropolitan regions. The accident records of the risk management plan (RMP) facilities in southern California provide an illustration for the discussion. Statistical tests demonstrate that previous accident counts correlate with future counts. The research heightens the usability of the existing accident record for local governments in the US. This paper explores whether the risk of a toxic release during transport is greater in poor and minority neighborhoods using a combination of mapping and statistical methods. Cluster analysis is used to examine the density of facilities and transport spill events as well as test for the spatial covariance between facilities and spills. Strong clustering of transport spills is evident, as well as clustering between factory sites and transport spills. A spatial model demonstrates raised rates of transport spills surrounding clusters of toxic firms. Most spills in Los Angeles occurred within 2 km of an intermodal facility. 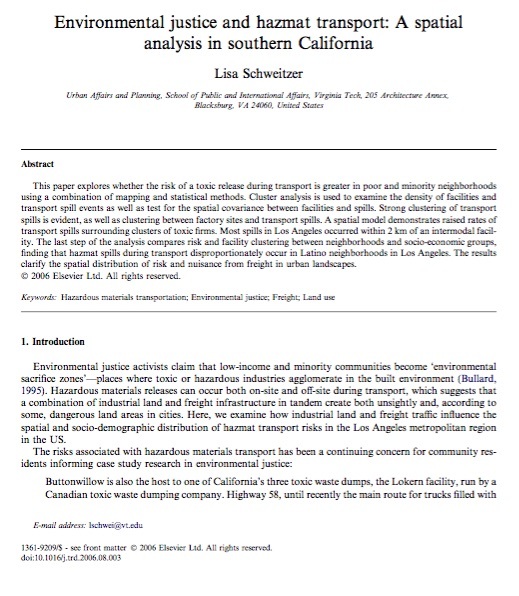 The last step of the analysis compares risk and facility clustering between neighborhoods and socio-economic groups, finding that hazmat spills during transport disproportionately occur in Latino neighborhoods in Los Angeles. The results clarify the spatial distribution of risk and nuisance from freight in urban landscapes. Schweitzer, L., Brodrick, C-J, , and S. Spivey. 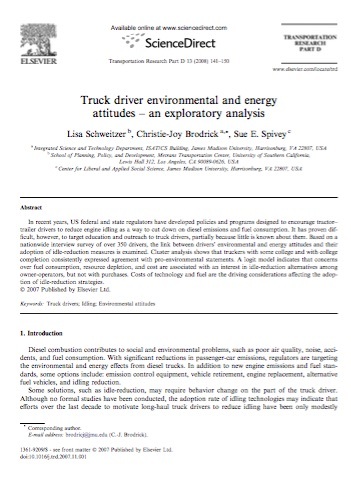 2008.Truck Driver Environmental Attitudes and Behaviors: An Exploratory Analysis. Transportation Research Part D. 13 (3): 141-150. In recent years, US federal and state regulators have developed policies and programs designed to encourage tractor–trailer drivers to reduce engine idling as a way to cut down on diesel emissions and fuel consumption. It has proven difficult, however, to target education and outreach to truck drivers, partially because little is known about them. Based on a nationwide interview survey of over 350 drivers, the link between drivers’ environmental and energy attitudes and their adoption of idle-reduction measures is examined. Cluster analysis shows that truckers with some college and with college completion consistently expressed agreement with pro-environmental statements. A logit model indicates that concerns over fuel consumption, resource depletion, and cost are associated with an interest in idle-reduction alternatives among owner-operators, but not with purchases. Costs of technology and fuel are the driving considerations affecting the adoption of idle-reduction strategies. Belief that transportation investment and operations have caused environmental damage in poor and minority communities to benefit the more affluent has prompted planning agencies to craft policies aimed at promoting environmental justice. Yet, we have only scattered evidence about the distribution of the costs and benefits derived from transportation policy, investment, and planning. This article creates a framework based in distributive justice for categorizing the existing research into cost-based and benefit-based claims of injustice. The authors go on to synthesize the cost-based research, which measures the distribution of pollution and hazards from transportation. From this survey, myriad research opportunities emerge. Chakraborty, J., L. Schweitzer, and D. Forkenbrock. 1999. Using GIS to Assess the Environmental Justice Impacts of Transportation System Changes. Transactions in GIS. (3)3: 239-258.